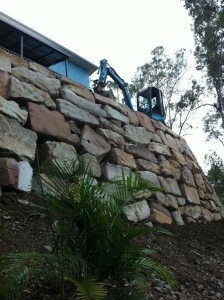 Retain Terrain specialise in the professional construction of custom designed and engineered rock walls, concrete sleeper walls, hand pitched stone walls and other forms of retaining structures with the highest standards in the industry, while retaining a one-on-one personalised service. Our designs are individually tailored to our clients budget and lifestyle, which enhances the exterior and liveability of their homes, to create the outdoor Aussie lifestyle we all love. We service Brisbane, Wamuran, Kilcoy, Hinterland, Sunshine Coast and everywhere in between.